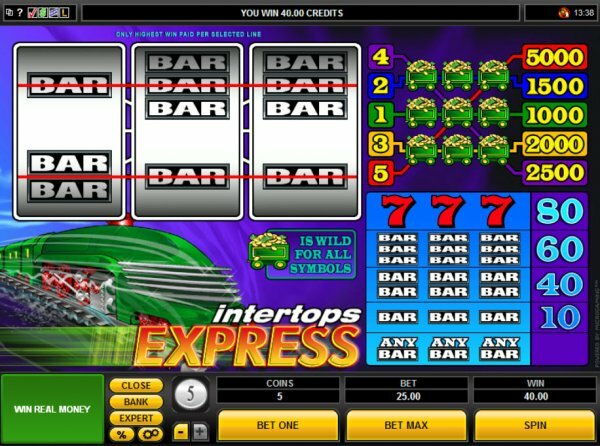 Designed for a casino called Intertops, Intertops Express is a train themed slot machine, with a very classic influence visible in it. The theme is unusual because it’s so rarely seen in slot machines, and among classic titles I believe it’s the only one of its kind. A high speed train is the star in this case, visible in the background. The slot machine is quite average in most other ways, but keep reading to find out everything there is to know about this Microgaming creation. You will find that Intertops Express has 5 lines and that it is a classic 3 reels title. You will also find a wild symbol inside, with prizes giving you up to 5,000 coins ($25,000). The game doesn’t do a lot of things in the feature section, offering a single symbol with a special role, a wild. This wild that is offered uses the image of a cash filled train wagon, though it looks more like a mining cart or a toy. It can be a very rewarding symbol, since whenever it forms its own combinations it will pay you up to 5,000 coins. The exact amount you walk away with depends on the exact line on which the three wilds land, with the minimum of 1,000 coins offered by the 1st line, while the maximum of 5,000 coins coming from the 5th line. As for the wild’s substitution ability, it is used like in any other slot. It has to land in just the right place on a payline, with the rest of the symbols either matching or having one wild among them. There aren’t any symbols that don’t benefit from its presence. 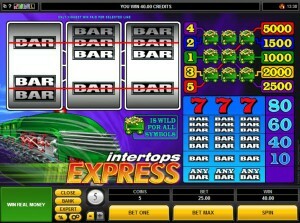 Up to 5 coins are used in a wager in Intertops Express, each one activating a different payline. The only way to vary the line bet is by changing the denomination, the minimum being $0.25, while the maximum is $5. Wagers can reach a top value of $25. The jackpot is offered for three wilds on the payline, but the amount you win depends on the exact line where they appeared. The best payout is available on the 5th bet line, which awards 5,000 coins and they’re worth up to $25,000. The high speed train that is shown in the background looks almost futuristic, but the impression will change once you take a look at the money filled wagon, which looks like it’s either a toy or inspired by a mining cart design. Overall, the best looking part is the background picture, the symbols either looking crude or classic. Symbols: Gold Cart (5,000 coins, wild), Red 7 (80 coins), Three Bar (60 coins), Two Bar (40 coins) and One Bar (10 coins). If you’re a fan of trains, then it’s one of the few options available to you out there, so go for it. If you’re not, you will discover that dozens of similar slots are available, when it comes to the classic influence, features and prizes offered. This Intertops Express slot is offered by all online casinos with Microgaming software, playable either in practice or in real money mode.